"The clothes in your closet are the cheapest to wear and fit best". This is what I told myself a few days ago. I've actually been shopping for a few items this fall but I end up returning everything... I have enough clothes. I've been leaning towards remixing rather than adding new items. If you notice from my last few posts, most of the outfits consist of items that have been worn a few times, but in a different way. There are probably up to 1000 remix possibilities with my wardrobe right now. 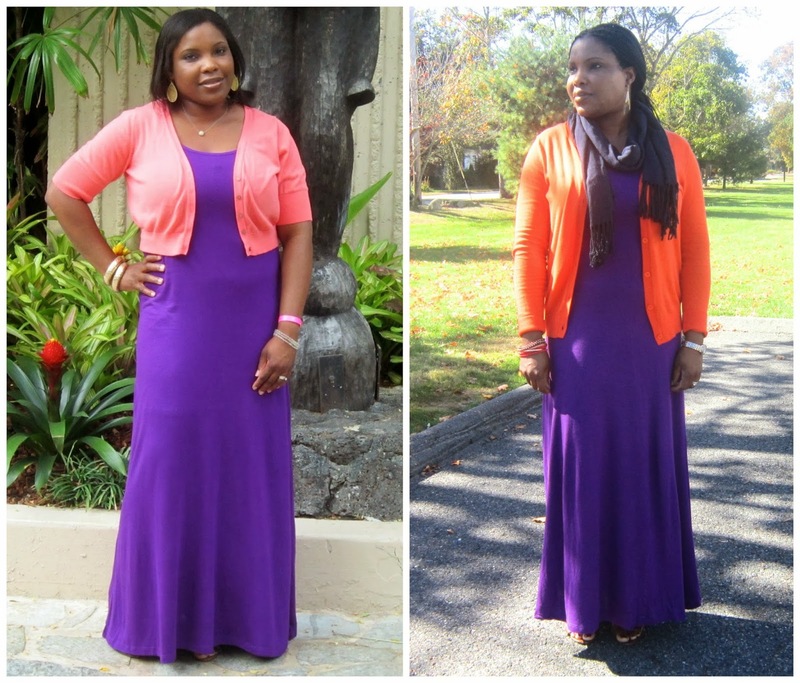 Today, I'm remixing my purple maxi previously worn here in the summer. The Remix: I prefer the maxi dress with the longer cardigan. The longer cardigan conceals the mid section bulge and makes me look slimmer. What do you think? How do you try to dress slimmer?